Food truck festival season is underway, and hungry folks from across the suburbs are lining-up for their favorite treats. From lobster rolls to empanadas, shaved ice and toasty cheese sandwiches — there’s no shortage of variety to please the palate. 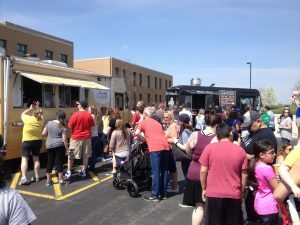 Last month, hundreds of people made it out to Oswego East High School’s second annual Food Truck Feast to indulge in the area’s finest food truck fare, and this Friday, they’ll assemble again in downtown Aurora to munch. 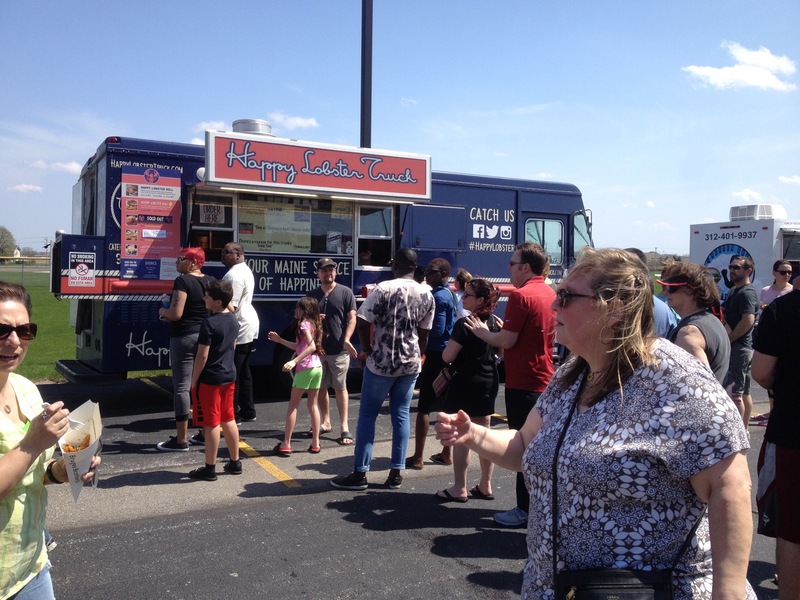 Nearly 20 different trucks or eateries will be on-hand to satisfy any craving during Aurora’s Food Truck Festival. The event takes place during the city’s First Friday’s celebration held from 5-10 p.m. downtown. Trucks will line up Benton Street from River Street to Water Street in conjunction with events happening at businesses throughout the area. 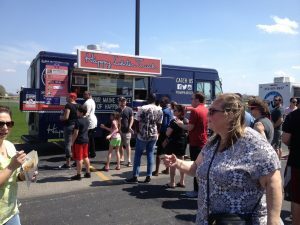 An East Aurora Food Truck Rally is also scheduled to take place Memorial Day weekend at Belle Salle Banquets in Aurora. On May 26, approximately 10 trucks will gather in the lot, accompanied by a DJ. If the events are anything like Oswego’s most recent food truck festival, lines will be long, but the food worth the wait. And, while these gatherings are great, don’t expect to see trucks parked on the corner of your favorite street serving lunch anytime soon. In Naperville, the practice is prohibited. 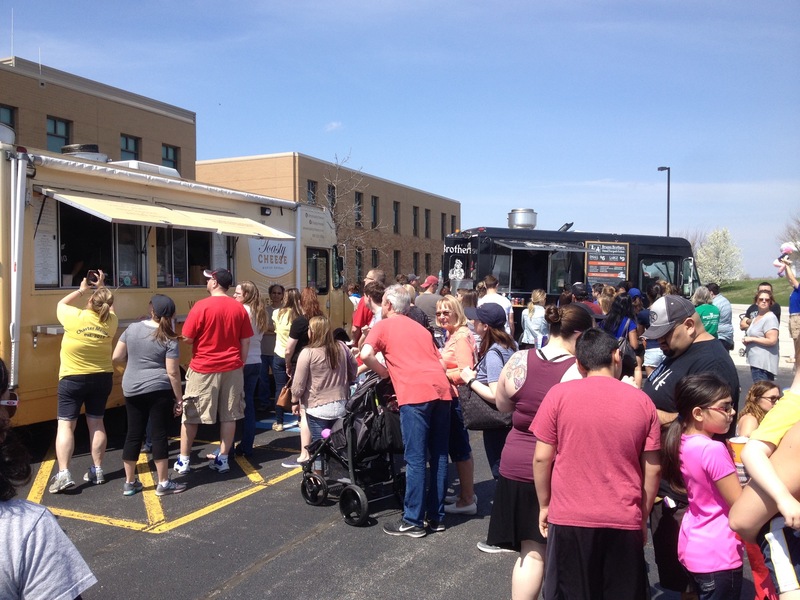 Trucks are welcome to park on private property, but the city of Naperville does not allow food trucks on city streets or parking lots. “They are only allowed on private property with the permission of the property owners and must have the required paperwork from the (DuPage or Will) county health department,” said City Clerk Lynn Zillinsky. Zillinsky said no one has ever approached the city council about wanting to park in the downtown area. “Food trucks are only allowed on public streets or parking lots in conjunction with a city permitted event,” Center said. Last August, about 3,000 people descended upon Elgin’s Festival Park for radio-show host Eric and Kathy’s Food Truck Festival. There were 18 trucks that took part in the permitted event. Food trucks are also allowed on private property in Elgin, but for a short period of time, Center said. In places like Wheaton and Oswego, food trucks are welcome along city streets, but rarely seen. “From a suburban standpoint, it’s hard to get the density of people and traffic that a truck needs to succeed,” said Jim Kozik, director of Planning and Economic Development for the City of Wheaton. Kozik acknowledged the obstacles faced by food truck vendors when they attempt to escape the festival circuit and venture out on their own. 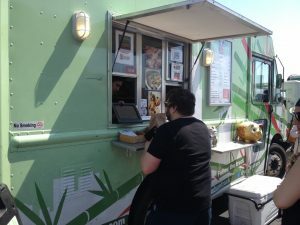 In October 2016, the Oswego Village board voted 5-1 to allow food trucks to operate on their public property — but a number of restrictions and fines were put in place. Trucks are not allowed on certain streets and in certain public areas throughout the village, and there is a 90-minute time limit on how long a truck can remain in a stationary location. Despite the time regulation, Oswego Village trustee Joe West said in October when the ordinance passed that he felt it was unfair for a truck to pull-up next to a brick and mortar business and steal customers. His was the board’s only vote opposing the ordinance’s approval. “It seems kind of unfair to the person that’s paying rent on that property to have the truck paying only $200 to be there,” he said. Trucks operating on public property in Oswego must pay a $200 yearly licensing fee for their first vehicle and $100 for an additional truck. Trucks parked on private property must pay only $25. County health departments also charge for licensing, which is required. So, while you don’t see them often roaming city streets, you’re likely to run into a plethora of trucks parked together as festivals gain popularity and city approval.